The moment I saw Pinky get her leg nearly over her crib to climb out I knew it was time to start thinking about getting her a big girl bed. It was within days of that first try that she was able to get her self over the side of her crib and from that moment she started sleeping with us. I just wasn’t comfortable with her climbing out and hurting herself. I spent lots of time trying to decide between going with a toddler bed or a twin. I wanted the bed to be low to the ground. When she sleeps she is all over the place to we wanted to be sure she would be close to the ground in the event she did roll off the bed. Because a toddler bed only lasts a few years we decided to go with a twin. So I set off to find a low profile twin bed with girly, feminine touches. That’s when I discovered South Shore Furniture and was offered the opportunity to review one of their children’s beds. They have so many options for kids bedroom furniture and any finish you could want. When they showed me the Tiara Collection it was like they read my mind on what I was looking for! The Tiara collection comes in a nice clean pure white finish and has lovely soft, feminine curves and features. We received the Tiara Twin Mates Bed and bookcase headboard. The bed and the headboard arrived in two heavy boxes ready-to-assemble. Taking all the pieces out we got a little overwhelmed but once we started to go over the instructions and get all the hardware together it was a lot less overwhelming. It took us a few hours (I’m guessing around 5 hours, though we did it in broken up sessions) to get both the bed and headboard together. The instructions made it easy to understand, each of the pieces are labeled with a letter so that you can easily match it up with the instruction diagrams. The bed is very well made and solid, I am very happy with it and know it will last her for many years to come. It looks just as adorable in the photos as it does in person. It has drawers at the bottom which are great for extra storage which is always great to have in kids rooms. They slide out and in easily and smoothly so I don’t have to worry about Pinky struggling with them. The drawers have very chic hardware that adds just the right amount of a sparkly girly touch. The headboard doubles as a bookcase for your child to store favorite books, photos and toys and is another great storage area. The curvey details at the bottom of the bed and on the headboard make it perfect for a little girls room but it’s also not too girly that you could outgrow the style. It’s very versitile so wether its in a toddler, tween or teens room it can fit to match the decor. Her room is turning out great and the South Shore Tiara Collection Twin Mates Bed and Headboard was the perfect solution for both a girly transitional bed that is also multipurpose for lots of storage. Pinky loves being able to put her favorite toys and books on the headboard, which helps her to feel more comfortable transitioning to a new room and big girl bed. South Shore Furniture has tons of furniture collections and pieces for children’s rooms and every other room in your home at great prices. Visit South Shore Furniture to view them all! These beds look so nice. I like the fact that they have drawers underneath the bed. No dust bunnies under the bed just the drawers which gives you more storage space for things. Also with the shelves at the top of the bed gives you more space to put your clock and other things you want close at hand. They are nice to because they are not as high a bed as alot of them are. What little girl wouldn’t love it, it’s so darn cute. So versatile too! Thanks for sharing. Beautiful bed!! 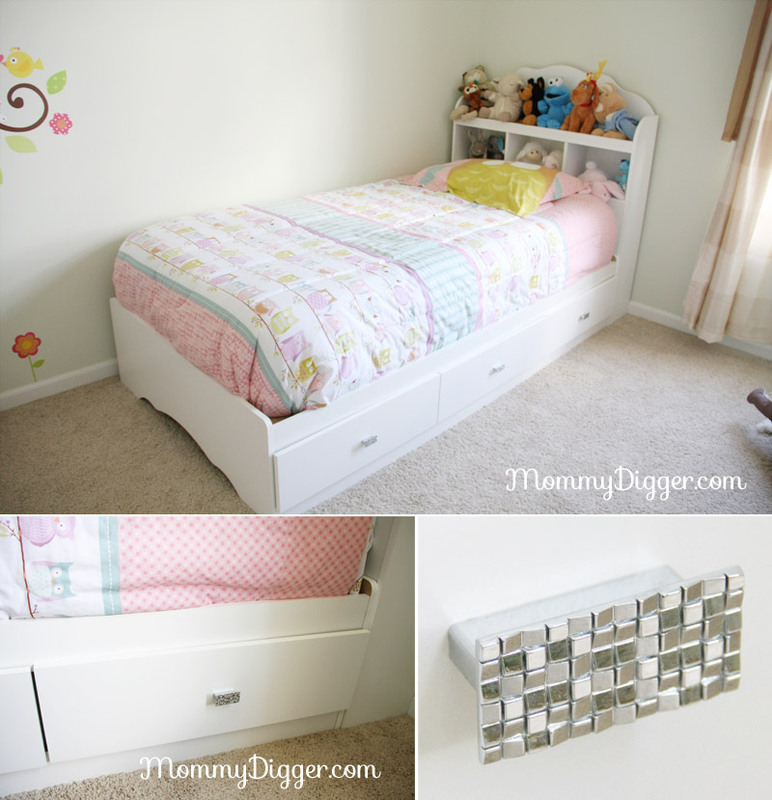 Goes perfectly with her room and I love the little knobs. What an adorable bed. I love the bookshelves and drawers. My grand daughter would love to have a bed like this. This is really cute and I love all the space saving going on with the bed! I love the cubby area for the child’s items. This looks like a great quality bed! Thanks for posting this, It’s exactly what I was looking to do. Kiddo is about to climb out of her crib also and I didn’t want to do a toddler bed because she already is such an awful sleeper. I figured that transitioning once to a twin bed would make more sense for us. Love all the extra storage! That’s an adorable bedroom that you have put together. Great Job! That is a really pretty bed! I also love the owl comforter set – so cute! What an adorable bed! Any little girl would love it! Beds like this would be perfect for my granddaughters. There are 5 of them and 3 children’s bedrooms. Thanks for sharing. The bed is adorable. My little guy will be moving out of the crib soon and a toddler bed while cute, is a waste of money. We have decided to go with a twin bed. I will have to check out this company. Cute bed for a girl and it does look very well made. I went to check out their website to see their boy offerings and I was thrilled to see so many different offerings. I’m sure we would find something there for our little one too. That looks a lot like the bed I bought my daughter. The drawers underneath the bed were optional and I didn’t get those to save some money, but I wish now I had.